Cumulus humilis indicates a dry day ahead. Marestail shows moisture at high altitude, signalling the later arrival of wet weather. It is in Earth's middle latitudes, between roughly 30° to 60° North and South, that a significant portion of humanity's daily activities take place. It is also within these rough boundaries that "weather" can be said to happen, that is, where meteorological phenomena do not persist over the long term, and where it may be warm, sunny, and calm one day, and cold, overcast and stormy the next. A great percentage of the world's population lives in the equatorial regions, but for the most part, these regions do not experience weather as it is understood by this definition. The Sahara Desert in northern Africa, for instance, is almost uniformly hot, sunny and dry all year long especially due to the non-stop presence of high atmospheric pressure aloft, whereas weather trends on the Indian subcontinent and in the western Pacific, for instance, the monsoonal belt, occur gradually over the very long term, and the diurnal weather patterns remain constant. Weather folklore, therefore, refers to this mid-latitude region of daily variability. While most of it applies equally to the Southern Hemisphere, the Southern Hemisphere resident may need to take into account the fact that weather systems rotate opposite to those in the North. For instance, the "crossed winds" rule (see below) must be reversed for the Australian reader. A red sunset probably means dry weather the next day. rosso di mattina mal tempo si avvicina. Ochtendrood, vanavond water in de sloot. 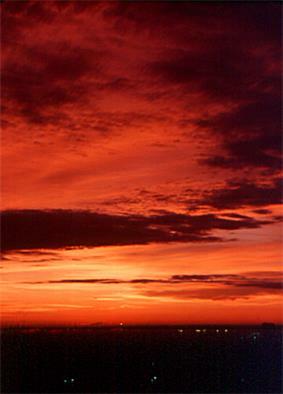 Weather systems typically move from west to east, and red clouds result when the sun shines on their undersides at either sunrise or sunset. At these two times of day, the sun's light is passing at a very low angle through a great thickness of atmosphere commonly known as the Belt of Venus. The result is the scattering out of most of the shorter wavelengths—the greens, blues, and violets—of the visible spectrum, and so sunlight is heavy at the red end of the spectrum. If the morning skies are red, it is because clear skies to the east permit the sun to light the undersides of moisture-bearing clouds coming in from the west . Conversely, in order to see red clouds in the evening, sunlight must have a clear path from the west in order to illuminate moisture-bearing clouds moving off to the east . There are many variations on this piece of lore, but they all carry the same message. You know how to interpret the appearance of the sky, but you cannot interpret the signs of the times." Cold, blustery northerly winds typically accompany a low pressure system. In western European seas, this description of wind direction is an excellent illustration of how the weather events of an active low pressure area present themselves. With the approach of a low, easterly winds typically pick up. These gusty winds can be unpleasant for a number of reasons; they are often uncomfortably warm, dry, and dusty in the summer and bitterly cold in the winter. Northerly winds, which follow around a low, are cold and blustery. Sailing in conditions of northerly winds requires expertise and a boat capable of handling heavy waves. Southerly winds usually bring warm temperatures, and though they may not necessarily feed the fish, they do provide pleasant fishing weather. The best circumstance, however, is to have a westerly wind blowing; the wind condition is likely to persist for some time, the weather should remain fair and clear, and the wind should be relatively constant. Wind and weather observations will be different for a low passing to the north of the observer than for one passing to the south. When a low passes to the north, the winds typically pick up from the east, swing to southerly (possibly accompanied by light precipitation, usually not) with the passage of the low's warm front, and then switch to northwesterly or westerly as the cold front passes. Typically, if there is any heavy precipitation, it will accompany the passage of the cold front. When a low passes to the south, on the other hand, winds will initially pick up from the east, but will gradually shift to northerly. Overcast skies and steady precipitation often occur as the center of the low passes due south, but skies will clear and winds will gradually become westerly as the low moves off to the east. No observer will experience all the weather elements of a low in a single passage. Calm conditions, especially with clear skies, indicate the dominance of a high pressure area. Because highs are broad regions of descending air, they discourage the formation of phenomena typically associated with weather, such as clouds, wind, and precipitation. 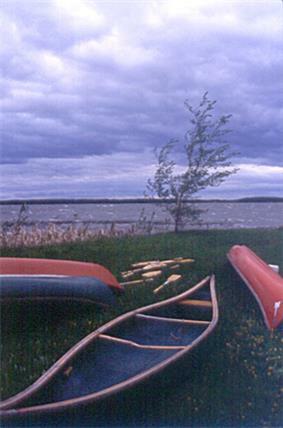 Calm conditions, though, may also result from a circumstance known as "the calm before the storm," in which a large thunderstorm cell to the west may be updrafting the westerly surface wind before it can arrive locally. This situation is readily identifiable by looking to the west — such an approaching storm will be close enough to be unmistakable. In winter, though, calm air and clear skies may signal the presence of an Arctic high, typically accompanied by very cold air, and it is difficult to imagine describing a temperature of -35 °C as pleasant. Seagulls are not especially fond of standing or walking. They are naturally at home in flight, and where they can, they sleep on the water. However, seagulls, like people, find gusty, turbulent wind difficult to contend with, and under such circumstances, the water is also choppy and unpleasant. Seagulls huddled on the ground are not a predictor of bad weather as much as they are a sign that the weather is already bad. 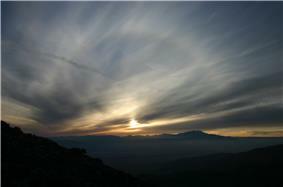 A halo around the sun or moon is caused by the refraction of that body's light by ice crystals at high altitude. Such high-level moisture is a precursor to moisture moving in at increasingly lower levels, and is a good indicator that an active weather system is on its way. Halos typically evolve into what is known as "milk sky", when the sky appears clear, but the typical blue is either washed-out or barely noticeable. This high, thick cirrostratus cloud is a clear indicator of an approaching low. In the coldest days of winter, a halo around the sun is evidence of very cold and typically clear air at and above the surface. But sun dogs are indicators that weather conditions are likely to change in the next 18 to 36 hours. The weather will favour the umbrella maker! Moisture in the air causes wood to swell, making doors and windows sticky, and salt is a very effective absorber of moisture. With a high level of moisture in the air, the likelihood of precipitation is increased. The magnesium carbonate and later calcium silicate in iodized salt acts as an anti-clumping agent in humid conditions, leading to Morton Salt's umbrella girl logo and slogan "When it rains, it pours". Fog is formed when the air cools enough that the vapor pressure encourages condensation over evaporation. 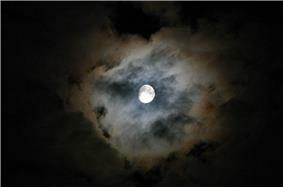 In order for the air to be cool on a summer night, the sky must be clear, so excess heat can be radiated into space. Cloudy skies act like a blanket, absorbing and reradiating the heat, keeping it in. So if it is cool enough (and clear enough) for fog to form, it will probably be clear the next day. Winter fog is the result of two entirely different circumstances. 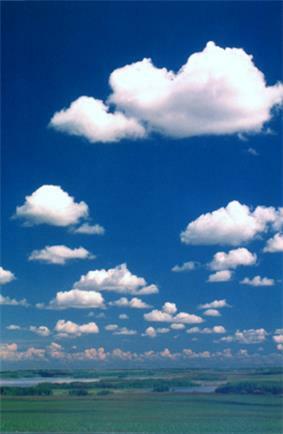 Above the ocean or a large lake, air is typically more humid than above land. When the humid air moves over cold land, it will form fog and precipitation. (To the east of the North American Great Lakes, this is a common phenomenon, and is known as the "lake effect.") In northerly climates, ice fog may form when the temperature drops substantially below freezing. It is almost exclusively an urban phenomenon, when the air is so cold that any vapor pressure results in condensation, and additional vapor emitted by automobiles, household furnaces, and industrial plants simply accumulates as fog. This piece of lore is true in summer but conditionally false in winter. Moisture-laden air is a better conductor of sound than dry air, so moist air carries sounds farther. In winter, temperature also becomes an important factor. If the air is warm and moist, the rule holds. If the air is very cold, it is also very dense and a better sound conductor than warm air, and also likely to be much drier. When sounds carry over a long distance, the cold, clear weather is likely to linger. This rule may be true under a few special circumstances, otherwise it is false. By standing with one's back to the ground-level wind and observing the movement of the clouds, it is possible to determine whether the weather will improve or deteriorate. For the Northern Hemisphere, it works like this: If the upper-level clouds are moving from the right, a low-pressure area has passed and the weather will improve; if from the left, a low pressure area is arriving and the weather will deteriorate. (Reverse for the Southern Hemisphere.) This is known as the "crossed-winds" rule. Clouds traveling parallel to but against the wind may indicate a thunderstorm approaching. Outflow winds typically blow opposite to the updraft zone, and clouds carried in the upper level wind will appear to be moving against the surface wind. However, if such a storm is in the offing, it is not necessary to observe the cloud motions to know rain is a good possibility. The nature of airflows directly at a frontal boundary can also create conditions in which lower winds contradict the motions of upper clouds, and the passage of a frontal boundary is often marked by precipitation. Most often, however, this situation occurs in the lee of a low pressure area, to the north of the frontal zones and convergence region, and does not indicate a change in weather, but rather, that the weather, fair or showery, will remain so for a period of hours at least. And aches will throb, your hollow tooth will rage. There have been medical studies done which indicate some people experience this effect. The most likely reason is that with a fall in atmospheric pressure, blood vessels dilate slightly in reaction. This has the effect of aggravating already-irritated nerves near corns, cavities, or arthritic joints. Studies are inconclusive, however, with some researchers attributing this effect to selective memory. One of the problems in testing the veracity of traditions about the weather is the wide variety to be found in the details of sayings and traditions. Some variations are regional, while others exhibit less of a pattern. If on February 2 (Groundhog Day in the United States and Canada) the groundhog sees its shadow, thirty days of winter remain. If not, spring will follow immediately. Annual records show that the groundhog prediction is not correct beyond chance. In other words, there is no correlation between cloud cover on that day, and the imminence of springlike weather. In Wales this proverb is applied to the month of April more often than March, especially in the borders. but it was recognized to not work well. The reverse is true as well. If the weather is nice early, it comes in like a lamb and will go out like a lion. Late-night rains and early morning rains may simply be the last precipitation of a passing weather front. However, since fronts pass at night as often as they do in the day, morning rain is no predictor of a dry afternoon. However, this lore can describe non-frontal weather. Given sufficient surface heating, a late-day rainstorm may continue to develop into the night, produce early precipitation, then dissipate by late morning. This, though, is the exception rather than the rule. Only 40% of rain is produced by convective events—60% is the result of a frontal passage. your barn will be filled with hay and corn. "Blows its horn" refers to thunderstorms. While March thunderstorms indicate that the weather is unusually warm for that time of year (thunderstorms can occur only with a sufficiently large temperature difference between ground and sky and sufficient amounts of moisture to produce charge differential within a cloud), it is no indicator of the long-term weather trend. It is still unwise to plant your annuals before the long May weekend. This verse, and so many others like it, attempts to predict long-range conditions. These predictions have stood the test of time only because they rely on Drought cycles or El Niño winters are a perfect example of such circumstances. A pattern of cool summers and warm winters, for instance, can produce patterns in other natural events sensitive enough to be affected by changes in temperature or precipitation. In the British Isles, Saint Swithun's day (July 15) is said to forecast the weather for the rest of the summer. If St Swithun's day is dry, then the legend says that the next forty days will also be dry. If however it rains, the rain will continue for forty days. In France, Saint Medard (June 8), Urban of Langres (April 2), and Saint Gervase and Saint Protais (June 19) are credited with an influence on the weather almost identical with that attributed to St Swithun in England, while in Flanders there is St Godelieve (July 6) and in Germany the Seven Sleepers Day (June 27). There is a scientific basis to the legend of St Swithun's day. Around the middle of July, the jet stream settles into a pattern which, in the majority of years, holds reasonably steady until the end of August. When the jet stream lies north of the British Isles then continental high pressure is able to move in; when it lies across or south of the British Isles, Arctic air and Atlantic weather systems predominate. In Russia, the weather on the feast of the Protecting Veil is popularly believed to indicate the severity of the forthcoming winter. There was an old proverb from Romagna that ran: "Par San Paternian e' trema la coda a e' can." ("On St. Paternian's day, the dog's tail wags"). This Cervian proverb refers to the fact that the cold began to be felt around the saint's feast day. A farmers' saying associated with Quirinus' feast day of March 30 was "Wie der Quirin, so der Sommer" ("As St. Quirinus' Day goes, so will the summer"). Ice Saints is the name given to St. Mamertus, St. Pancras, and St. Servatus in German, Austrian, and Swiss folklore, so named because their feast days fall on the days of May 11, May 12, and May 13, respectively, a period noted to bring a brief spell of colder weather in the Northern Hemisphere under the Julian Calendar. ^ Thomas Fuller (1732). Gnomologia. B. Barker. ^ Punch v. 48. Tom Taylor. 1865. ^ Tom Coghlan Last updated at 12:01AM, April 16, 2012. "The Times, Follow St Swithin: book a British break". Timesonline.co.uk. Retrieved 2012-04-16.